Cruises From Boston To Canada - Top 5 Choices! 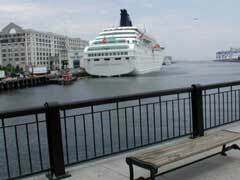 Cruises From Boston To Canada – Top 5 Choices! Cruises from Boston to Canada offer some of the most spectacular scenery and points of interest along North America’s Eastern coastline. With many lines taking advantage of the fall colours and the quaint and charming harbours and coves that make the Maritimes a spectacular place to cruise, you are sure to find an itinerary that makes your trip a memorable expedition to the East coast. Here are the top 5 New England and Canada cruises that depart from the historical port of Boston. 1. Aboard the Carnival Glory, Carnival Cruise Lines offers travellers a 5-day cruise roundtrip from Boston that explores Saint John, New Brunswick and Halifax, Nova Scotia. 2. Cruises to Canada aboard Royal Caribbean leave Boston for a 7 day roundtrip on The Jewel of the Seas. This cruise stops in US ports like Portland and Bar Harbor as well as the Canadian ports of Saint John and Halifax. 3. If longer cruises from Boston to Canada are what you are looking for, the offering from Holland America is sure to please. Aboard the Veendam, you are treated to 14 days of sailing stopping at such ports as Bar Harbor, Halifax, Sydney, Charlottetown, Quebec City and Montreal as well as cruising the St. Lawrence River and the Gulf of St. Lawrence as well. 4. Seabourn Cruises have a splendid 10 day jaunt along the Eastern coast, on a trip from Boston to Montreal, with stops in Bar Harbor, Halifax, Charlottetown, Gaspe, Baie Comeau, Saguenay, and Quebec City as well as cruising in the Saguenay Fjord. 5. Canada cruise deals aboard the Norwegian Dawn by Norwegian Cruise Lines afford you a 7-night cruise roundtrip from Boston with stops in Portland, Bar Harbor, Saint John and Halifax. Cruises from Boston to Canada are created with the most picturesque places in mind. While you are never far from a rugged coastline, these cruises can take you to the heart of the Canadian East coast where the maritime history is coupled with breathtaking views and salty breezes. The port of Boston not only caters to the New England cruises, it also calls Boston to Bermuda cruises home, allowing you to escape to yet another beautiful island from the convenience of big city Boston. Cruises from Boston to Canada have it all, come and visit the east coast of North America, its stories await.